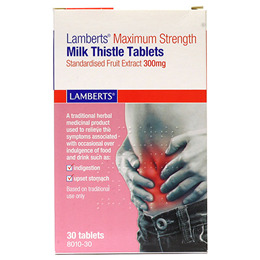 Milk Thistle is a traditional herbal medicine used to relieve the symptoms associated with occasional over indulgence of food and drink such as indigestion and upset stomach. Silymarin is the active principle from the fruit of Milk Thistle (Silybummarianum). 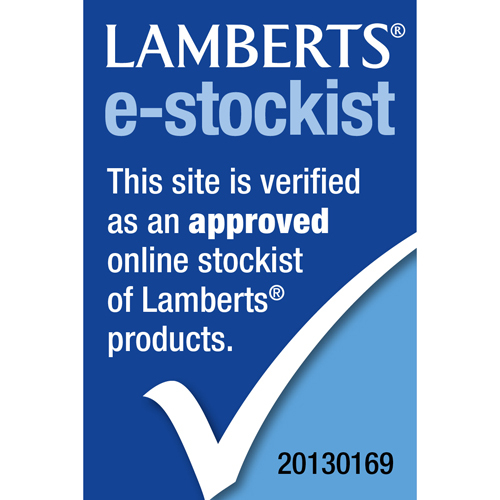 Lamberts use a standardised extract from mature seeds, with a guaranteed level of 80mg silymarine per tablet. It takes a full 3 grams of whole milk thistle herb to produce 100mg of milk thistle extract, the amount found in just one milk thistle tablet. Milk thistle is one of the most extensively studied herbs in use today, with over 300 scientific studies on its chemistry and application, and is widely recommended by practitioners. Milk Thistle fruits(Silybum marianum(L.)) Gaertner, Maltodextrin, Microcrystalline Cellulose, Sodium Croscarmellose, Stearic Acid, Magnesium Stearate, Colloidal Hydrated Silica, Plydextrose, Hypromellose, Titanium Dioxide, Curcumin, Copper Chlorohyllin, Medium Chain Triglycerides. Tablets should be swallowed whole or with water or other liquid. Allergic to any of the ingredients or to plants of the Asteraceae/Composiate family such a daisies, marigolds or artichokes. Read the enclosed patient information leaflet carefully before using this product. Your symptoms worsen, if they do not improve after one week. 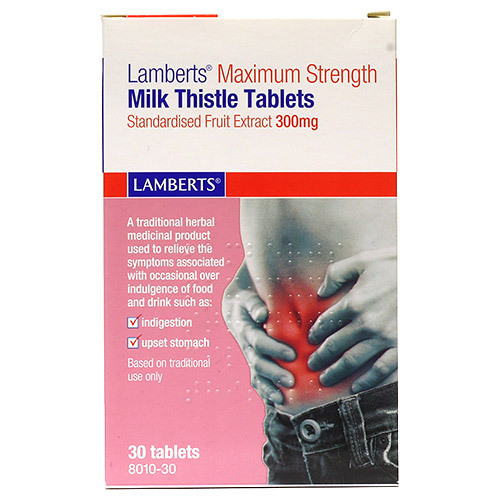 Below are reviews of LAMBERTS Milk Thistle - 30 x 300mg Tablets by bodykind customers. If you have tried this product we'd love to hear what you think so please leave a review.